Nowadays, budget DVD players are two a penny. Even some of the bigger brand names like LG and Toshiba are offering players at less then a price of a DVD boxset. So, the arrival of a newcomer like the Xoro HSD 8410 probably won't create much of a ripple. Which is a shame as the Xoro HSD 8410 cuts to the quick, much like the legendary swordsman, with a slim line player that includes a bewildering array of functions and connections. Most important is the addition of an HDMI output that allows upscaling of your standard definition DVDs to 720p and 1080i. If the player is set on HD Auto, the resolution is selected automatically to suit the screen. Testing the player with a 42-inch HD Ready plasma, the kind of screen that exposes the shortcomings in the cheaper DVD player range, the Xoro HSD 8410 performs remarkably well, opting for a picture output of 720p. This can be manually changed to 1080i, but without much noticeable difference to the image quality. Upscaling is also possible via component video, although the player does ask you to confirm that your screen is compatible with Progressive Scan. 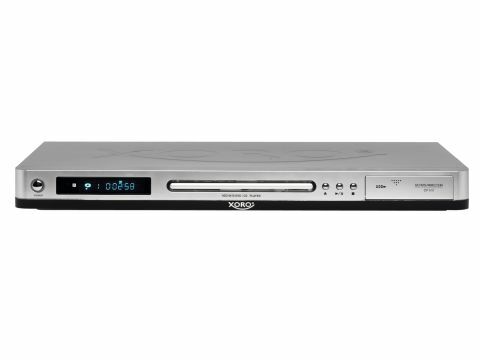 Like all DVD players, but especially the low-budget variety, it's better to opt for these two settings, as there is a definite degradation of picture with S-video or composite video. Simplicity of use is definitely the key phrase here. Multi-region from the box, the HSD 8410 performs admirably well with both Region 1 and 2 discs. The choice of aspect ratio is limited to either 4:3 or 16:9, but there are zoom options for increasing picture size. As most of the menu settings, with the exception of the HDMI, are already in place, you can literally plug-in and play. The button-laden, but well-laid out remote control gives instant access to the key controls including a simple switch between card, DVD and USB. Just pull down the front flap on the player, insert any camera card in the relevant slot and a JPEG menu instantly appears. Press 'enter' and your holiday snaps will appear in a choice of thumbnail or full screen. The Xoro 8410 also includes a 5.1 surround output that streams Dolby Digital and DTS signals to an external amplifier for the full home cinema experience, making The Return of the King sound really impressive. The picture quality at 720p is also very good with excellent definition and bright colours. The Battle of the Pelennor Fields sequence is a fearsome test for any DVD player, thanks to its fast editing, computer graphics and muted colours - and the HSD 8410 handles the visuals extremely well. The Xoro HSD 8410 fares well with the colourful Krell machinery in the Region 1 DVD of Forbidden Planet. With its multi-functionality and impressive array of connections, the HSD 8410 is incredibly good value (even more so if you're looking for a second room player). The only drawback is the Xoro's limited availability. Which is a pity as it's more than ready to cross swords with its low-priced competitors.